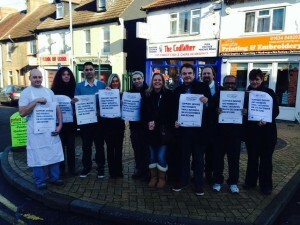 Tristan Osborne backs Small Business Saturday in Luton Village to encourage local traders to grow. Small Business Saturday UK was initiated by Labour’s Shadow Business Secretary Chuka Umunna MP following the success of the concept in the USA. Last year, Britain’s first ever Small Business Saturday was a huge success, with an additional £500m ringing through the tills of small firms while 40 per cent of local authorities took part. As a party, Labour would cut – then freeze – business rates for small firms which have seen soaring bills under the Tory-led government. Since 2010, small businesses have seen business rate hikes of £1,500 on average. Labour would also take tough action to tackle late payment to small firms and freeze their energy bills. "As ward councillor for Luton I have built a strong partnership with local traders and business. Small business is the backbone of our local economy and residents should do all they can to support and nurture them. I am proud that Labour representatives across Medway are standing by small business"
“Building on the success of last year, Small Business Saturday 2014 will be even bigger and better, helping to provide a much-needed boost to our High Streets and making even more consumers aware of the fantastic products and services offered by small and independent businesses. “And it’s not just about retail – the day is an opportunity to raise three cheers for the businesses which provide us with the essential services we need, and thank the unsung heroes who run Britain’s 5 million small firms.